Guangzhou, the third largest city in China, has a long history dated back over 2000 years. As a major port city, this city of 12 million is the cradle of cultural and economic reforms and revolutions that shaped modern China, and it remains the thriving commercial and cultural center to this day. Glimpse of old temples stand side by side gleaming architecture of modern skyscrapers, and the city isn’t just the birthplace of traditional Cantonese cuisine, but it’s now also the home of fine French, Italian, and international cuisines. 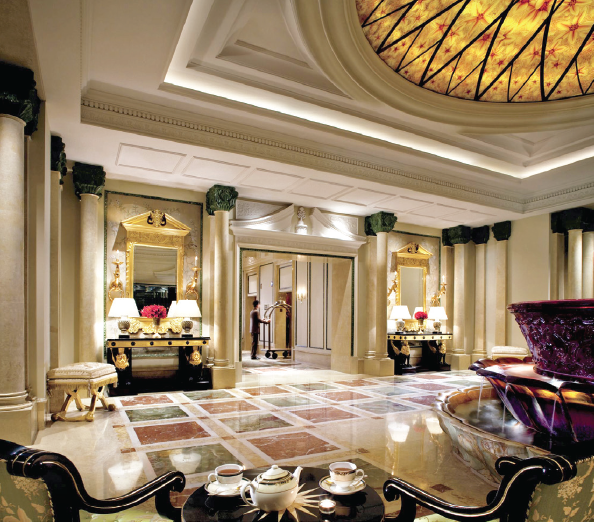 Come and experience Guangzhou where tradition meets modernization and stay in the best hotels the city has to offer. Langham Place iconic architecture can be seen from miles away against Guangzhou skyline. The innovative modern design is the creative work of Andrew Bromberg from Aedas International Architecture Firm, and it’s the first giveaway of what to expect of this luxury hotel. Walking into the lobby, you’ll find yourself in a sleek gleaming marble hall and a 22-storey tall atrium that allows for lots of natural light. Langham Place Guangzhou expands more than 900,000 square feet and offers exceptional experiences, from elegant rooms and suites and five dining venues, to a heated pool and the Langham’s signature Chuan Spa. 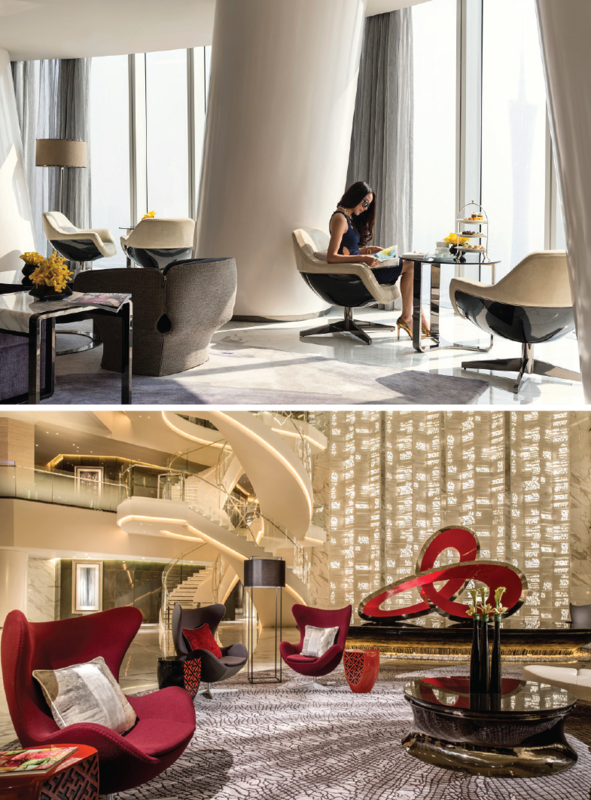 Inviting rooms and suites in warm colour and modern furnishing are designed to relax, inspire, and surprise with Langham’s signature amenities and large floor-to-ceiling windows overlooking Guangzhou cityscape. 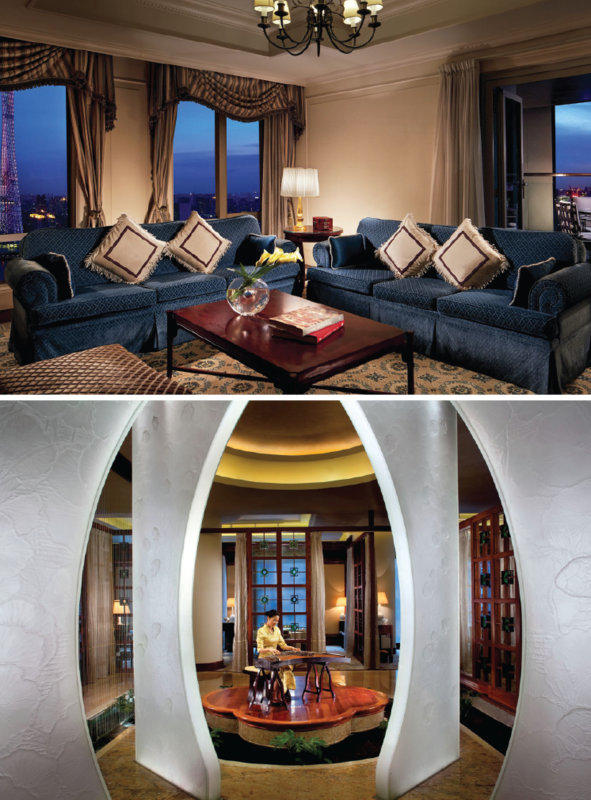 Besides the city views, every room’s door looks out over the central atrium, showing off the grandeur of the hotel. THE INNOVATIVE MODERN DESIGN IS THE CREATIVE WORK OF ANDREW BROMBERG FROM AEDAS INTERNATIONAL ARCHITECTURE FIRM, AND IT’S THE FIRST GIVEAWAY OF WHAT TO EXPECT OF THIS LUXURY HOTEL. 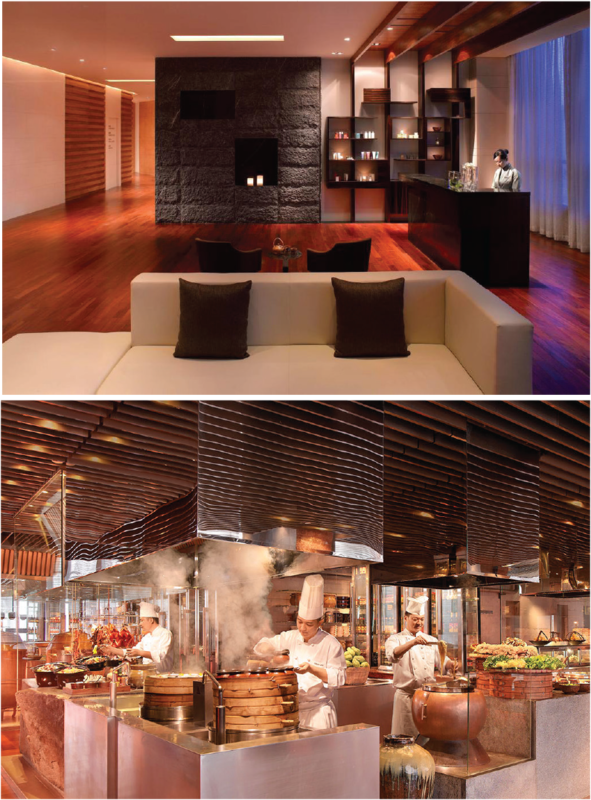 Food is a big part of a luxury hotel and Langham Place offers a variety of culinary delights served in breathtaking settings. 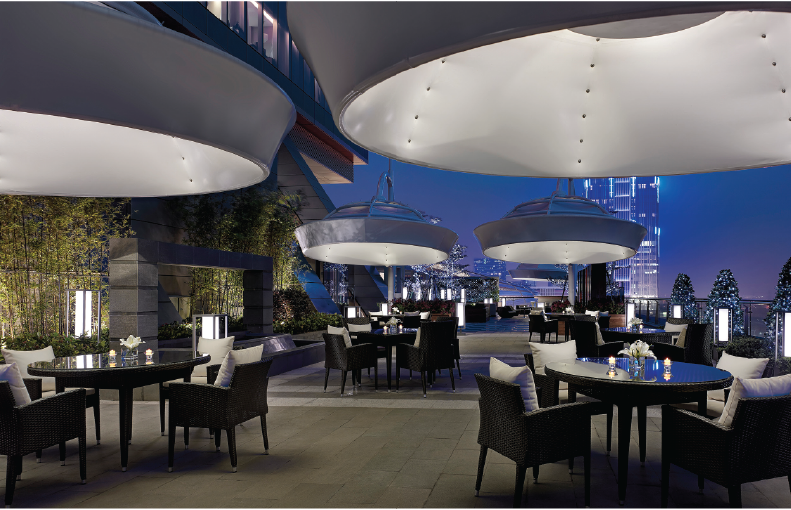 Savour authentic Italian flavours made with premium ingredients in a semi-outdoor setting at Alfresco. Since you can never grow tired of Chinese food, Ming Court serves contemporary Chinese menus in an ultra-modern atmosphere, and those seeking an elevated experience high above the ground can visit Sky Bar, where handcrafted cocktails and vintage wines are served alongside panoramic views of the Pazhou skyline. Location seems to be an advantage that makes a great hotel exceptional. Grand Hyatt Guangzhou boasts centrally located location in the CBD of Zhujiang New Town within close proximity to Tianhe Sport Center, Guangzhou International Convention Center, and Canton Fair Grounds, as well as many tourist attractions, including Tee Mall and Opera House. Getting to other parts of town is also a breeze as Tiyu Milu Metro Station is just a 10-minute walk away. Modern and elegant interior awaits inside with stylishly decorated rooms and suites designed for both business and leisure travellers. All 368 guestrooms command Guangzhou downtown views, and they are very well-equipped with luxury amenities and facilities for your most comfortable stay. Besides the location, business travellers will be pleased to know that Grand Hyatt Guangzhou offers over 1500 square meters of flexible meeting and event space – all fitted with the latest business equipment and facilities. For a more exclusive experience, upgrade to a Grand Club Room and enjoy an even more personalized services and a private lounge overlooking sweeping cityscape. MODERN AND ELEGANT INTERIOR AWAITS INSIDE WITH STYLISHLY DECORATED ROOMS AND SUITES DESIGNED FOR BOTH BUSINESS AND LEISURE TRAVELLERS. Although you are surrounded by fine dining options within the city, you don’t have to leave the hotel to enjoy some of the finest cuisines. Authentic flavours of Cantonese cuisine is served at The Penthouse in a stylish and contemporary setting where you can choose to dine in the main dining room or 1 of 12 luxurious residential-style private dining suites. If you prefer western fare, G sumptuously bring premium seafood and meat cooked in wood-fired ovens to the table while you enjoy the show from G’s dynamic open kitchen. For a relaxing pre or post dinner cocktail, The Guanxi Lounge serves refreshing drinks on a suspended bridge that connects the hotel’s two towers. Despite its central location, the hotel’s soundproofed rooms and suites are a sanctuary to relax and recharge. While you can gaze over the stunning views of Guangzhou city from the room’s large floor-to-ceiling windows, the room is completely quiet and peaceful. Enjoy a restful night on Marriott’s luxury bedding that includes pillowtop mattresses, feather beds, custom duvets and crisp linens, and allow yourself to be pampered in spacious marble bathrooms with Thann bath amenities, robes and slippers. All room also comes with a mini bar, large flat-screen TV, cable TV, and premium movie channels, as well as complimentary internet access. A day of pampering extends beyond your private rooms. A Spa, the hotel’s signature spa, offers a wide range of massage therapies and facial and body treatments, from Ayurvedic treatments, to body scrub, foot bath, and pampering massage. You can also take advantage of recreational facilities such as an indoor pool, a spa tub, and a sauna. GUANGZHOU IS A FASCINATING CITY, SO IS ITS HOTEL OFFERINGS. STANDING IN THE FOREFRONT OF GUANGZHOU’S LUXURY HOTEL SCENE IS THE INTERNATIONALLY RENOWNED MARRIOT HOTEL IN THE CONVENIENTLY LOCATED LOCATION ADJACENT TO GRANDVIEW MALL TO GRANDVIEW MALL AND WITHIN A STONE THROW TO THE CITY’S COMMERCIAL AND TRANSPORTATION HUBS. Perched on the top third of the iconic 103-storey Guangzhou IFC, Four Seasons Hotel Guangzhou commands some of the highest views of Guangzhou. Although it is located within a skyscraper, natural lights play a big part in the overall atmosphere. The hotel’s bold, modern design is inspired by nature with an accent of classic Chinese elements, and natural lights flood through all-window facade and the 30-story atrium that rises from the lobby, bringing the sky indoors. All 344 luxurious rooms and suites are among the most modern and spacious in the city. Since they are located between floors 74 and 98, they command unparalleled panoramas of Pearl River New City and beyond. The interiors are chic and contemporary, with grey, ivory and taupe tones accented by teal or plum upholstery. Each room is furnished with dreamy beds, luxury amenities, integrated entertainment and marble bathroom. THE HOTEL’S BOLD, MODERN DESIGN IS INSPIRED BY NATURE WITH AN ACCENT OF CLASSIC CHINESE ELEMENTS, AND NATURAL LIGHTS FLOOD THROUGH ALL-WINDOW FACADE AND THE 30-STORY ATRIUM THAT RISES FROM THE LOBBY, BRINGING THE SKY INDOORS. Sure, there are a lot of things to see and do in Guangzhou, but you might not have to leave the hotel at all to enjoy some of the best restaurants – all with spectacular views, of course. Starting from breakfast, Caffe Mondo combines a splash of Italian chic to casual all-day dining overlooking uninterrupted views of Pearl River Delta. Lunch and dinner options can be a little overwhelming as there are 3 incredible restaurants to choose from. Yu Yue Heen is an impressive venue to savour regional Cantonese specialties. On the other hand, Kumoi stylishly brings casual Japanese izakaya and teppanyaki to life, while Catch showcases exciting contemporary seafood menus from its lively open kitchen. 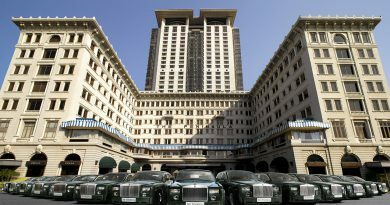 The Ritz-Carlton delivers world-class luxury experience in a striking East meets West concept. The hotel doesn’t just aim to provide the best service you would expect from a 5-star hotel, but it is determined to create a “Ritz-Carlton memory” unlike others. You’ll be warmly greeted the moment you arrive and welcomed with a cup of fine tea served by the fountain in the hotel’s Rococo-style lobby. Hints of Chinese elements are found dotting the interiors like vases and decorative objects, woodcarvings, wallpaper depicting Chinese landscapes and the lovely piece of imperial embroidery on the wall in the Pearl Lobby. 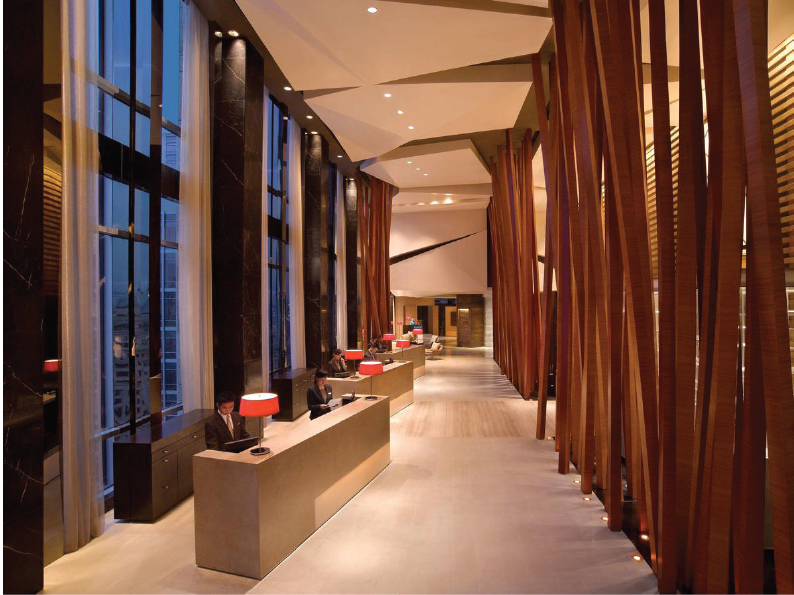 Elegance flows from the lobby through the halls and into the guestrooms. The rooms and suites capture the essence of the city, and they are perfect for making a base camp for city exploration or just relax and make yourself at home. 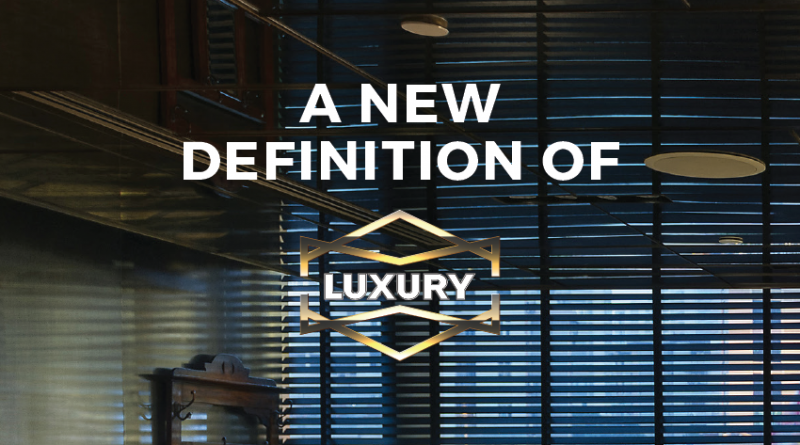 An enhanced experience awaits on the Club Level. With only 58 guestrooms, Club Level combines comprehensive, personalized service with exclusive amenities and unparalleled views. You’ll have access to the exclusive lounge and personalized Concierge to make travel arrangements, book theatre and restaurant reservations and plan local itineraries. GUANGZHOU IS THE BIRTHPLACE OF CANTONESE CUISINE AND YOU’LL FIND EXCEPTIONAL CANTONESE FLAVOURS AT LAI HEEN. 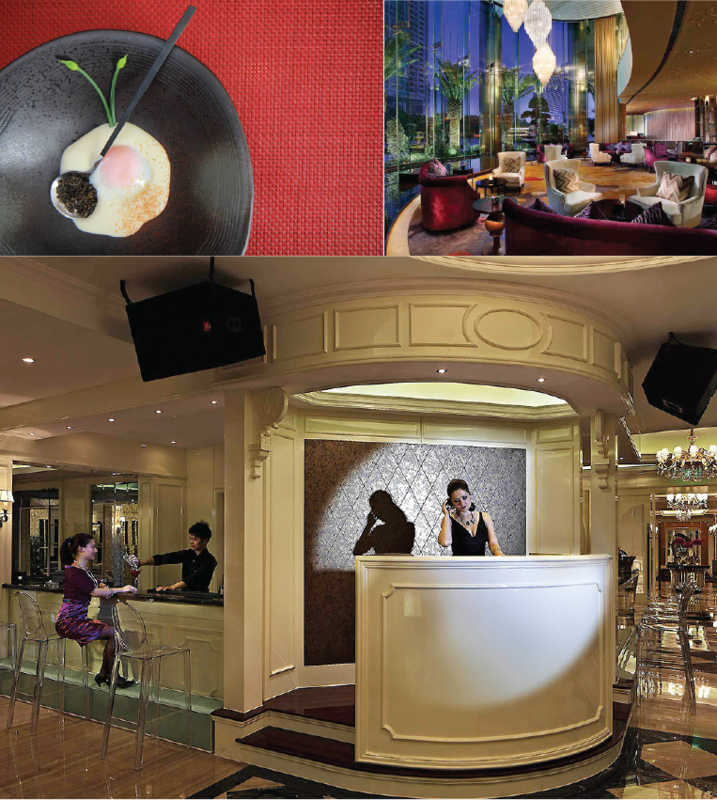 THERESTAURANT SERVES AWARD-WINNING CANTONESE DELICACIES IN AN INTRICATE, TRADITIONAL SETTING. The Ritz-Carlton Guangzhou also highlights the state-of-art Ritz-Carlton Spa. You are immediately relieved of all the hustles of the outside world once you walk into the soothing spa in organic tones and sumptuous finishes. Allow the spa’s caring staffs to deliver indulging treatments that are designed to restore the body, mind, and spirit. Enjoy the signature Pearl River Stone Massage with powerful essential oils and warm river-smoothed stones that ease tension and liberates energy flow, while the acupressure massage that follows brings an overwhelming sense of wellbeing and calm. The towering modern architecture of SofiteSl Guangzhou is located in Tianhe District close to local tourist attractions such as National Dr. Sun Yat Sen Memorial Hall, Museum and Tomb of the Southern Yue Kings, and within easy reach of Yuexiu Park. The interior combines local contemporary décor and Parisian Chic such as the design of the chandelier in the lobby that fuses French national flower fleur-de-lis and Guangzhou city flower Kapok and perfectly displays Sino-French influences. Featuring sleek and stylish design with Parisian touches, the guestrooms boast state-of-the-art Bose technology, and spacious bathrooms with rain showers and television mirrors, while the suites offer a sublime experience from the glowing skyline to scents of Hermès, sculptured red décor, and deluxe Sofitel MyBed. 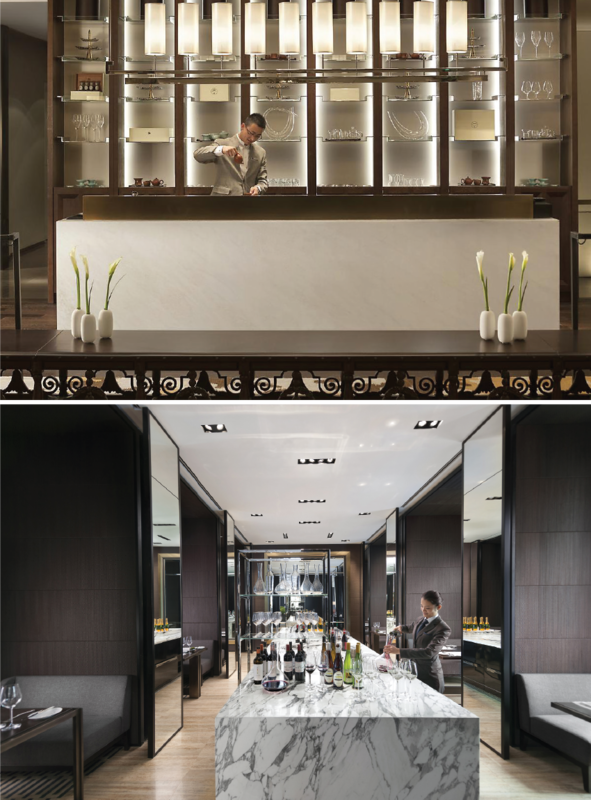 Steeped in luxury, Mar-Tea-Ni Bar is located near the lobby and features one of the best afternoon teas in Guangzhou. The bar’s Tea Sommelier will be your guide through the list of their offerings and pair your choice with exquisite French pastries. 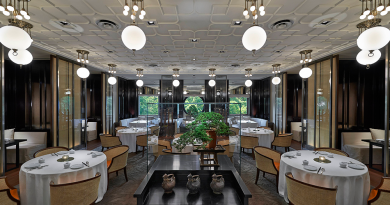 For a more sumptuous dining, Le Grill is as upmarket steakhouses as they can be. Expect wonderful array of succulent ultra-prime cuts seared on an Argentine grill, as well as Sofitel’s incredible wine selection, at this classy steakhouse. FRENCH SOPHISTICATION ALWAYS PAIR ELEGANTLY WITH ANY CULTURE. SOFITEL GUANGZHOU SUNRICH HARMONIOUSLY BLENDS SOFITEL’S RENOWNED LUXURY WITH LOCAL INFLUENCES AND WELCOMES YOU TO EXPERIENCE L’ART DE VIVRE – THE ART OF LIVING! Located in the heart of Zhujiang New Town, Park Hyatt Guangzhou reflects the unparalleled elegance of the Park Hyatt brand, ensuring a sophisticated and enriching experience for business and leisure travelers alike. The luxury hotel may have only 208 guestrooms, but what it lacks in number is made up in quality. The contemporary rooms and suites are generously sized between 52 – 260 square meters, and decorated in polished dark-wood floors and elegant modern Asian furniture and décor.This warm private space provides perfect sanctuary that overlooks the bustling city below. Feel at home at the Living Room and the Dining Room on the lobby floor. 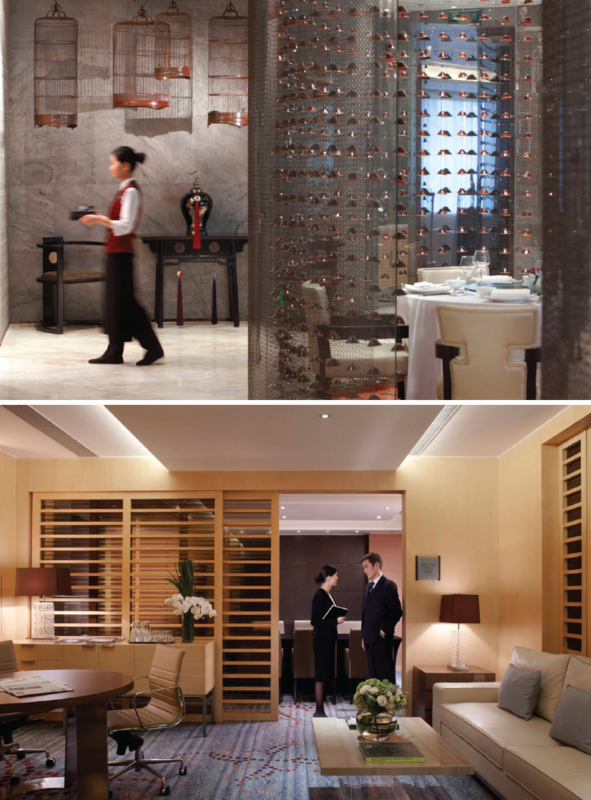 The Dining Room is Park Hyatt Guangzhou’s main residentialstyle restaurant, serving southern Italian cuisine, as well as international breakfast and semi-buffet lunch, in a contemporary and sophisticated setting with breathtaking views. On the opposite side of the lobby, the Living Room let you relax, eat, and drink in a residential-stule environment. The space literally feels like a big living room of an elegant mansion, and light Western and Chinese fares are available, as well as afternoon tea and a free-flow “Wine o’Clock” evening offering. 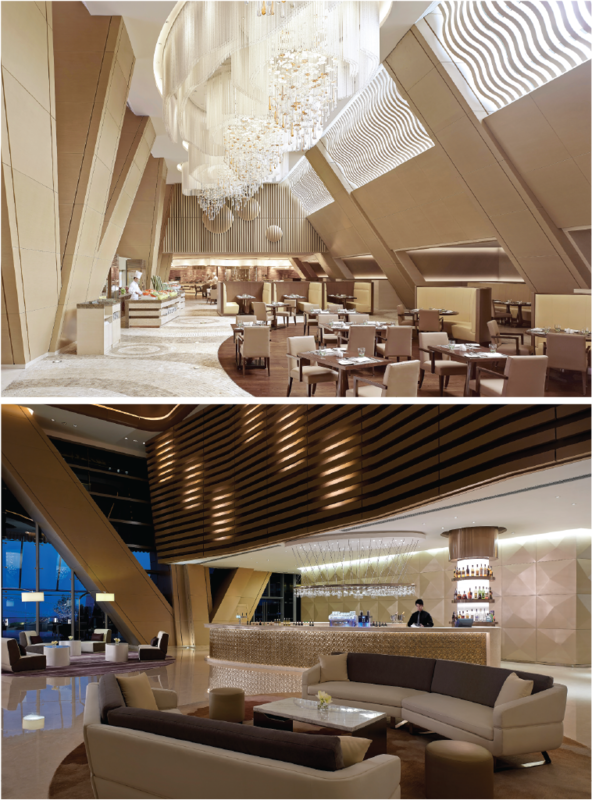 A more exciting dining experience awaits on the 68th floor. Yue Jing Xuan features eight, distinctly designed private dining suites and a spacious dining hall with enchanting views of the city. The restaurant’s concept of “Dining in the kitchen” means you will be dining next to a bustling open kitchen, so expect a show of ingredients and cooking skills! On the 70th floor is The Roof Bar, Guangzhou’s highest outdoor bar area with unbeatable views of the bustling city by day and its vibrant lights by night. 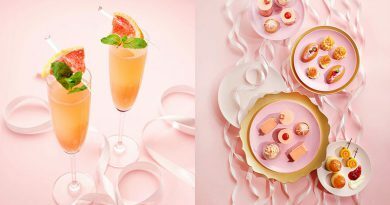 Creative cocktails are created by professional mixologists alongside a selection of delicious Western and Asian snacks and live entertainment. The Roof Bar is an ideal location for a pre or post dinner cocktail, as well as a late night drinks with friends. staying at Mandarin Oriental Guangzhou means you will be centrally located in the heart of Guangzhou within a convenient distance to Grand View Plaza and Canton Fair Complex. 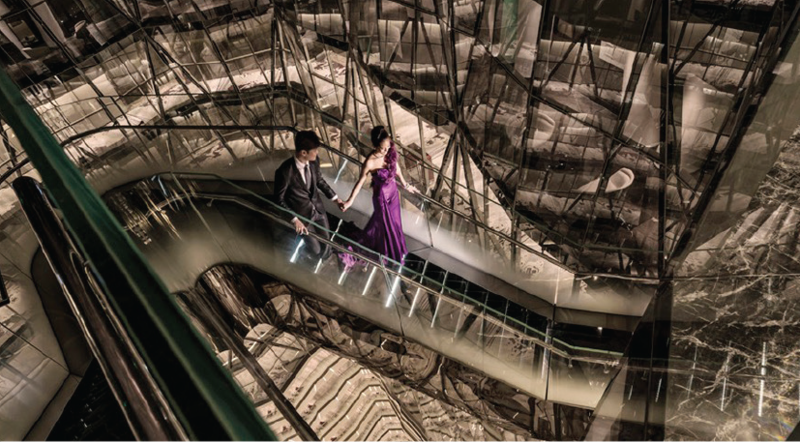 The hotel sits on top of TaiKoo Hui, a large retail and office complex, which allows the guests direct access to the complex, including the shopping mall. Designed by Tony Chi, the hotel stands out for its sleek and minimalist look, from the gleaming avant-garde lobby to the guest rooms filled with contemporary Chinese design and clean lines. Despite being in the city center, Mandarin Oriental Guangzhou sets the standard for the city’s largest room with 646 square feet of space for its basic room. The guestrooms feature double sinks, walk-in rain shower, and spa-inspired marble bathroom, as well as sweeping city views. 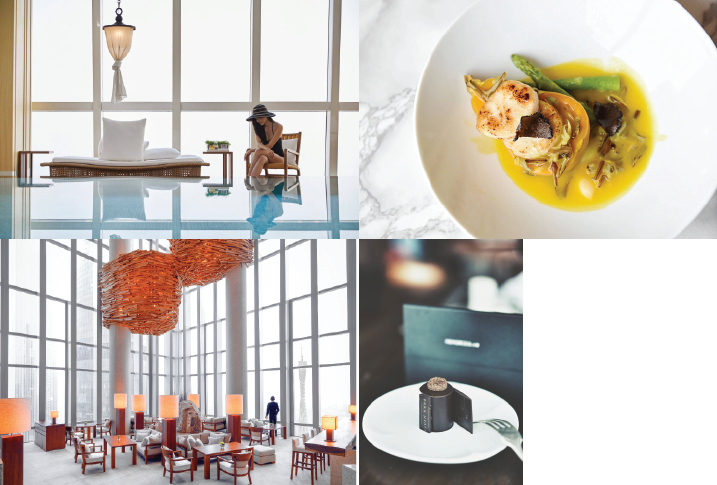 Inspired by a mix of classic and contemporary cuisine, Mandarin Oriental Guangzhou brings some of the best cuisines to the food capital of Southern China. Starting with arguably the city’s best Cantonese restaurant, Jiang by Chef Fei, which serves selections of Cantonese delicacies impeccably prepared according to time-honoured traditions, such as fluffy BBQ pork bun, smooth homemade egg tarts, and juicy dumplings. Enjoy casual all-day dining in a dynamic dining room with an open kitchen at Ebony. The restaurant offers a sumptuous breakfast buffet, while at lunch and dinner, it fires up the grill to cook up variety of prime cuts and fresh seafood. DESIGNED BY TONY CHI, THE HOTEL STANDS OUT FOR ITS SLEEK AND MINIMALIST LOOK, FROM THE GLEAMING AVANT- GARDE LOBBY TO THE GUEST ROOMS FILLED WITH CONTEMPORARY CHINESE DESIGN AND CLEAN LINES. Mandarin Oriental is also famous for its cake shop. You don’t have to be a sweet tooth to be enchanted by the intriguing macarons in rainbow flavours like Thai chai tea milk chocolate, and special flavours that changes with the holidays and seasons.